After an initial trip in March of 2017, I returned to New York to meet with Anna the following May, and then again in August. I’d discovered that Anna had an appreciation and a respect for Marilyn that few people realized. 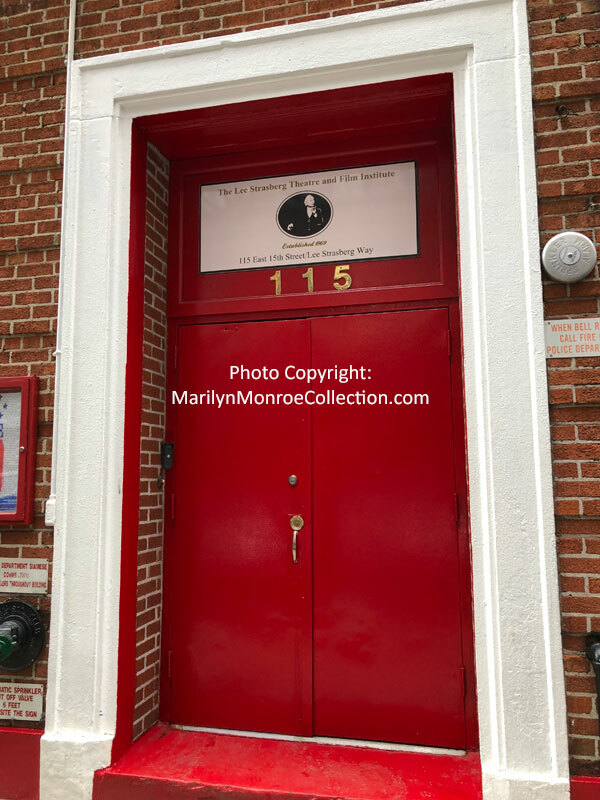 During my trips we visited the Lee Strasberg Theatre and Film Institute, or “the school” as Anna calls it, where method acting is still taught. An undeniable “who’s who” of Hollywood has called Lee Strasberg their teacher or LSTFI their home, including Chris Evans, Scarlett Johansson, Alec Baldwin, Uma Thurman, Barbra Streisand, Sally Field, Jon Voight, Armie Hammer, and, of course, Marilyn Monroe, Marlon Brando, Robert De Niro and Al Pacino (just to name a few). The Institute teaches acting, dancing, writing and other skills to young students from around the world and there’s a waiting list for enrollment. During our visits to the storage facilities, Anna and I discovered a vast collection of vintage newspaper clippings spanning the late 1940s through 1962. Normally this wouldn’t have been an exciting find for anyone. In this case however, it just happened to be Marilyn Monroe’s personal collection of news and media clippings, with stories about her circled in red wax pencil. Throughout her career Marilyn paid services to find press articles mentioning her so she could stay abreast of what the media was writing. 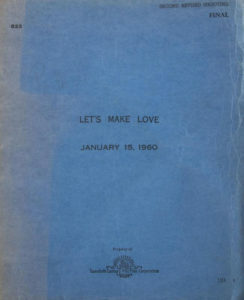 Also included with the clippings were magazines with stories featuring her, together with notes and letters from photographers and members of the press. It’s an astonishing archive. Quite amazingly, included are clippings from the late 1940s, documenting that Marilyn was collecting articles and mentions of the man who would be her husband someday: Arthur Miller. 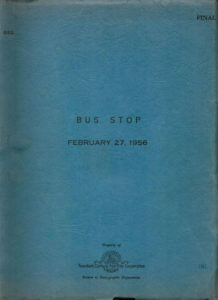 The collection of newspapers and magazines had been part of Marilyn’s estate. 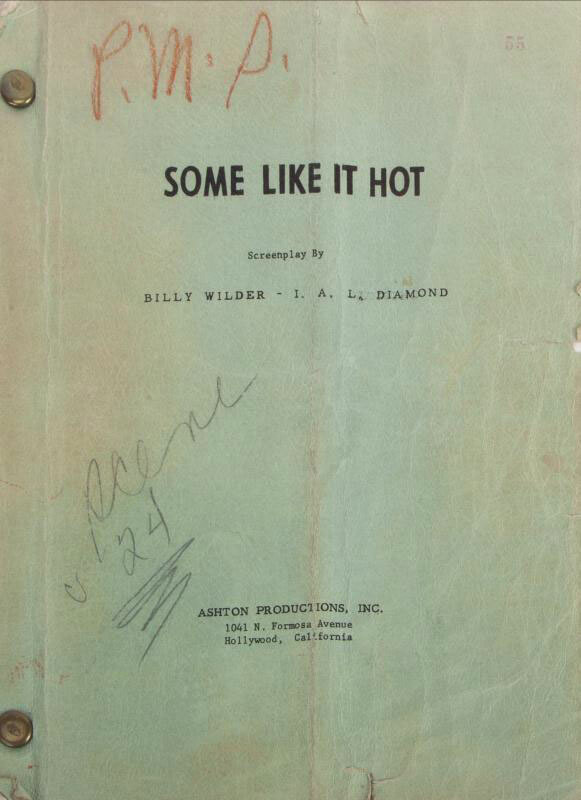 We also discovered a collection of scripts from Marilyn’s films that had belonged to Paula, including Bus Stop, Let’s Make Love and Some Like it Hot. Anna and I spent time together selecting items that would be sold at Julien’s Auctions later in the year. 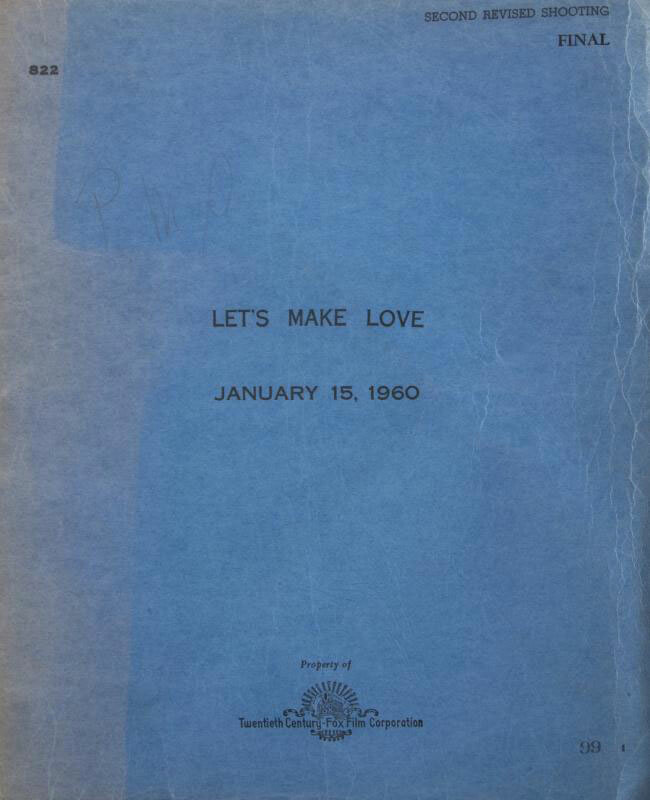 While we had discovered Marilyn’s media archive and Paula’s film scripts, we’d not found anything else of Marilyn’s. On my last full day in New York during my August trip, Anna and I headed back to the storage facility a last time to go through the licensed memorabilia and select pieces to send to Julien’s. I pulled box after box from the shelves for us to go through. Toward the end of the day I climbed up to the top shelf to grab a box that was near the back of the rack. It was one of the very last boxes for us to audit. I set it down next to Anna and we opened it. We discovered that it wasn’t memorabilia or merchandise inside, but clothing. I started to pull the pieces out one at a time. 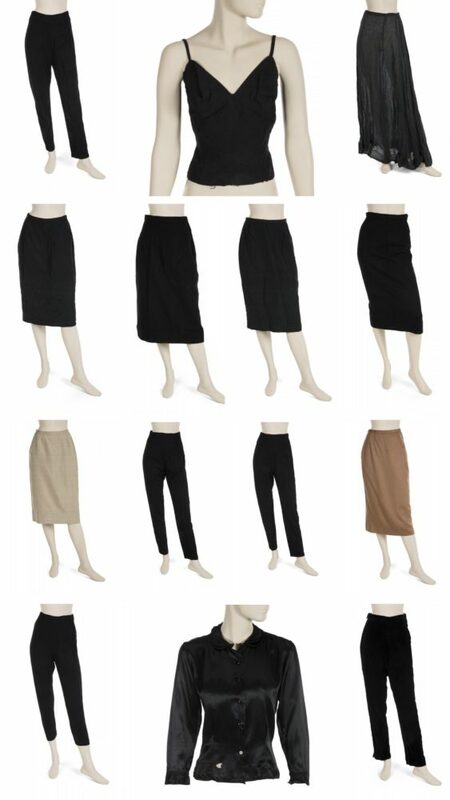 There were skirts in black and brown. 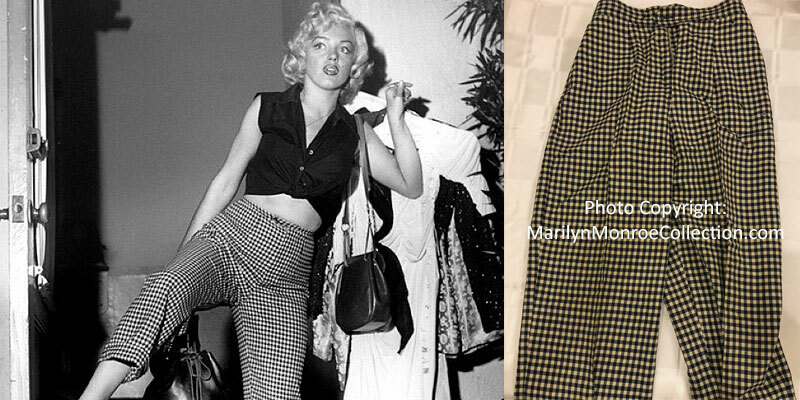 There were also several pairs of black pants, and then, a pair of black and white checked pants that are so synonymous with Marilyn. That’s when it hit me: These were Marilyn’s clothes. As I continued to pull out clothing items, I noticed a tiny beige colored top with spaghetti straps that were tied in knots. The label inside read “Jax.” I knew instantly that this was the top Marilyn wore as she recorded songs for Let’s Make Love. Photos of her wearing this same top showed the knots tied in the shoulder straps, and unbelievably they were still tied in knots that day. At the very bottom of the box was the holy grail of finds: A long-sleeved button-down shirt in black satin with an attached necktie. 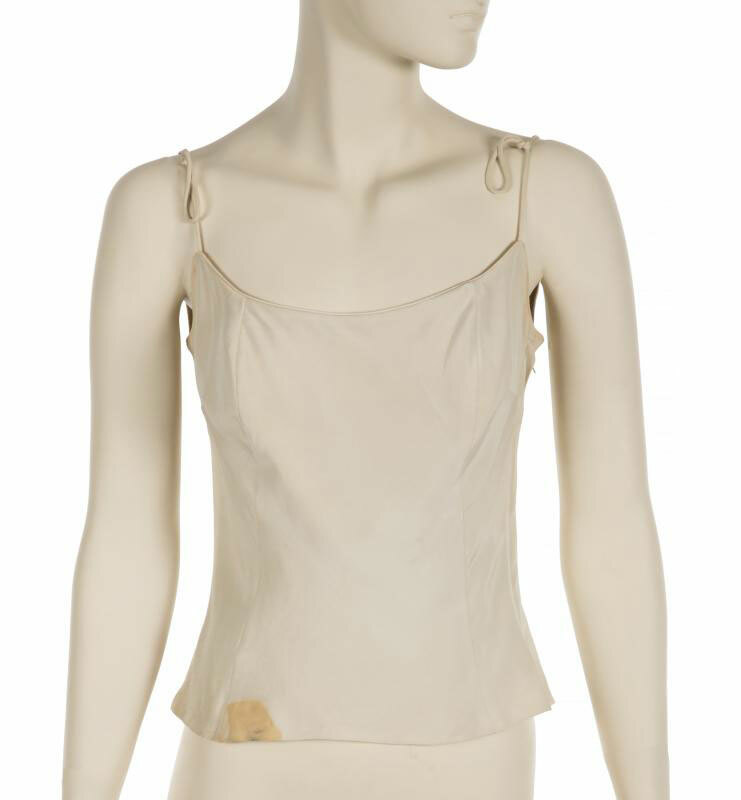 This, of course, was the blouse Marilyn wore during a press conference at the Los Angeles airport on February 26, 1956. At the initial moment of discovery I told Anna, “Bear with me, I’m having a Marilyn Monroe moment,” and she literally laughed out loud, and we reveled in the joy. 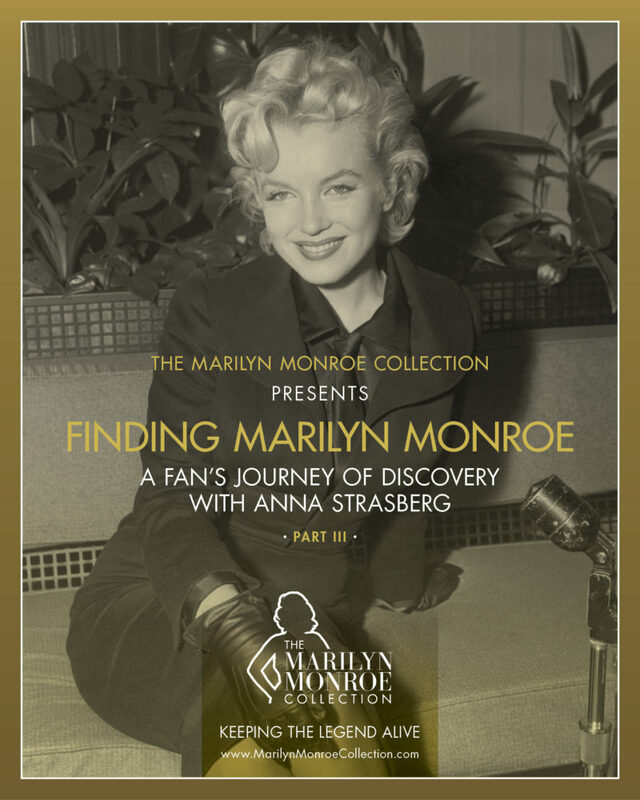 There are many items from Marilyn’s life and wardrobe that have never been found. For example, no one has ever seen the dress she wore to the 1955 East of Eden premiere, yet the matching cape survived and is now part of my collection. 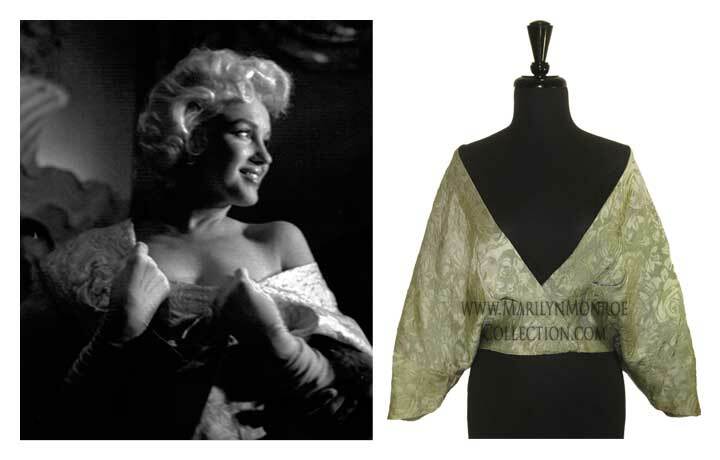 The dress that matches this evening cape, which Marilyn wore to the premiere of East of Eden in 1955, has never been found. The cape is now part of my collection. 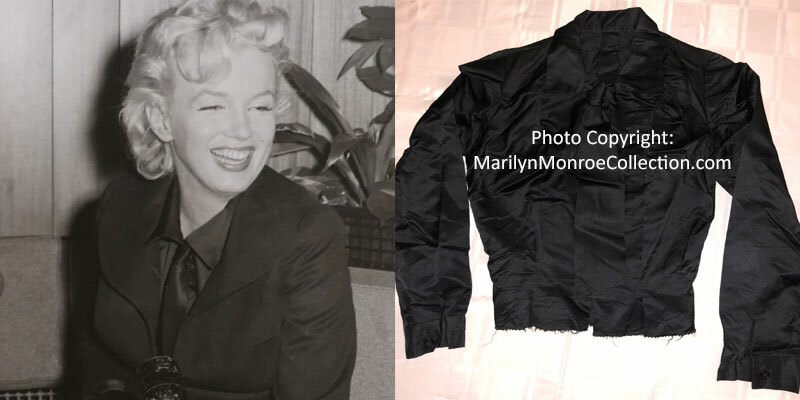 I’d thought Marilyn’s black wool jacket, seen in countless photos being worn by her, was also lost. Incredibly, the jacket was found in storage in 2016. I was lucky enough to win the jacket at auction and then reunite it with the mink fur collar Marilyn had always worn with it. The collar has been part of my collection since 2006. The famous Lucite shoes Marilyn wore with ribbon for laces have also never been seen. This blouse was yet another item that had not been seen publicly since Marilyn wore it. What a thrill it was to find it in storage. The rest of that day Anna heartily told everyone we encountered about my Marilyn Monroe moment of discovery. All totaled, the box contained six pairs of pants, most of them by Jax, four tops, six skirts, all custom-made for Marilyn, and one petticoat.All of the clothing items I’d found, along with Paula’s scripts, were sold at the November 2018 entertainment memorabilia auction at Julien’s. 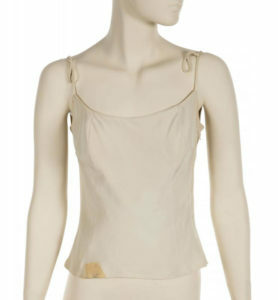 Marilyn’s Jax top sold for $11,250.00. 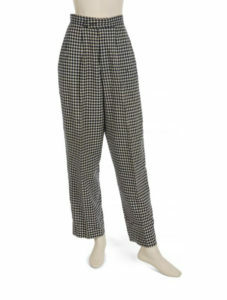 Marilyn’s black and white checked pants sold for $31,250.00. 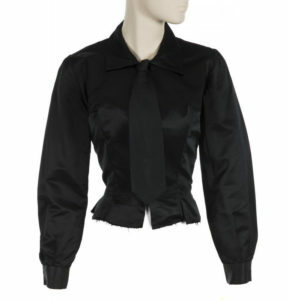 Marilyn’s black blouse with necktie sold for $43,740.00. What a find! I cannot image the feelings and the Marilyn moments you had. 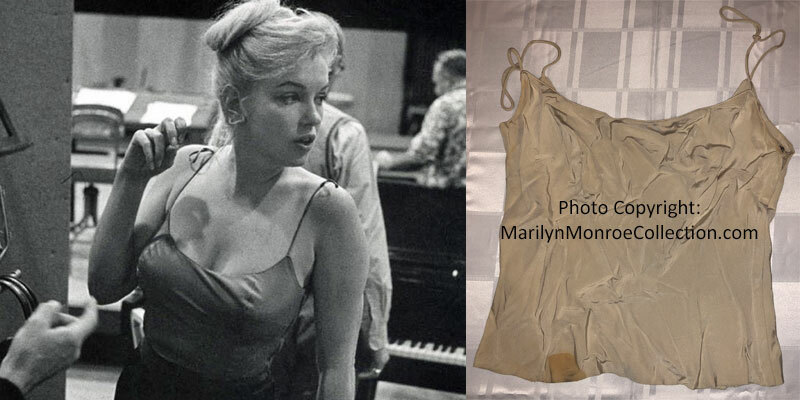 So glad the treasures that belonged to Marilyn were found. I am still curious about the lucite shoes she wore. Amazing! What a joy to read of your experience. I love Marilyn, to me she will always be alive as a symbol of joy respect and honor.. Sad that she died so young.. I collect what I can on her and read about her as well. Awesomeness……great story….got to know more about her life….thank you…. Awsome reading about Marlyn Monroe I to Love her. Beautiful, brilliant and moving. It has brought me to tears. Wonderful. I wonder if Marilyn gave the Lucite shoes to her sister. They were pretty magical. Thanks for the insights into her Wardrobe. Have both the Juliens & the Christie’s catalogue. She had extremely good taste.